the best things about this book is how inspiring it is for locals (let alone tourists). There’s something in it for all of us to get out and do, no matter how much we already think we know. You’ll get a chance to pick up a signed copy and meet the author, at Sundance Books (121 California Ave.), on Wednesday, May 24 from 7:00 to 8:30 p.m. There’s a rumor there will be prizes. And maybe snacks. Like tiny little chocolate ones. 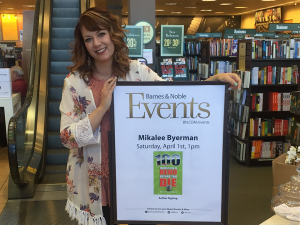 In honor of Mikalee’s next book-signing, we thought we’d ask her some questions about what led to all of this. You know, before she gets so famous she no longer talks to us. Q. The first, and most obvious, question is why did you decide to write this book? And is it true you owe Ben McDonald a billion dollars? A. This was a rare situation where the publisher came to me. They had reached out to the RSCVA to ask for the name of a local writer, and Ben gave them mine — in case you’re wondering why his name shows up on the acknowledgements page. The billion is negotiable. Q. As writers, we’re all about the deadlines, but we don’t normally get to choose our own. How did that happen? And why, on God’s green earth, did you make it so tight? A. They gave me some options on when they wanted it released, but I felt strongly it needed to come out before event season — a spring debut would hit bookstores before people started planning all their summer fun. I decided to go for it and gave myself two months to write the book from when I signed the contract. Because I’m crazy. Q. There are so many things to do in Reno before we die. How did you approach such a big topic? Q. You compare this book to Sophie’s Choice. Please to explain. A. Ok, spoiler alert: In Sophie’s Choice, Meryl Streep’s character is forced to (seriously stop reading if you haven’t seen it) choose which child to save, and which to relegate to the gas chamber. The torture of the impossible choice she’s forced to make is agonizingly palpable — and something I still think about, probably two decades after I saw it for the first time. So I’m symbolically comparing poor Meryl’s experience to mine, having to choose which child to save (whom to name in the book), and which to abandon to eternal damnation (those that didn’t make the book). It kept me up at night, because there were only 100 things I could include. Although I totally cheated, so there’s that. Q. Seems like your math might be a little off on the number 100. A. Oh yeah, the cheating. If you look in the index, there are well more than 100 things there. That’s because of this fabulous invention called a “list.” So I was able, for example to list “local theaters” as one of the things to do, then talk about three theaters (Brüka, Good Luck MacBeth and Reno Little Theater) on that specific page. See? I’m a total badass ninja rule-breaker. Q. There are obviously way more than 100 things that we all need to do in Reno before we die. How did you narrow it down? A. When multiple people would say the exact same thing, I knew I had to include it. But I did have to leave out so many things. When I got done researching, I had about 180 items and had to cull that list down to 100. And there are still a lot more out there. This underscores how blessed we are to live in this community — it’s a good problem to have that I had too many “things” I wanted to include! Q. What surprised you most in writing this book? Q. Conversely, what was so obvious you knew you had to include it the second you got the call to write the book? A. Interestingly, the things that topped my lists for all sections were destinations evocative of my childhood in Reno: The Nugget Oyster Bar, all the museums (but mostly Wilbur May Museum, thanks to the shrunken head, for which I’m still in therapy), Arlington Gardens, Balloon Races, the Pioneer Center, and so many more. So yeah, I recognize I may be using this book to take a walk down memory lane, but so be it. Q. Did you seriously dedicate a page to clouds? A. I’m sensing judgment. Yeah, I totally did. “Thing” #59 is all about places to watch the sunrise and sunset, because our skies in northern Nevada are absolutely breathtaking. As I travel as an adult, I’m struck by how most places have rather “meh” clouds. Ours are the coolest, and I feel like that’s something we should not take for granted. Hence, #59. Q. Any references to cannibalism? A. As a matter of fact: “Thing” #79 is about the Donner Party, which I call “one of the most significantly disastrous human pioneer stories in the history of the West.” And that, by the way, is a vast understatement. Q. What restaurant do I need to start making reservations for because of this book? And yes, I do realize it’s weird to ask about dinner right after cannibalism, but that’s the way the cookie crumbles. Or something. A. Casale’s Halfway Club is the epitome of Reno to me: quirky, interesting, historic, a little disconcerting from the outside, but once you’re in, you’re embraced as family! I love it there, and surprisingly, I had not been there until I started researching this book. Also, don’t miss Calafuria. And if you don’t mind a casino, Bistro Napa in the Atlantis for Happy Hour is fabulous (no reservations for that one), and Western Village Steakhouse is a surprising treat. Q. You only included a few big events like Artown, Shakespeare at Sand Harbor and the Balloon Races. How come? Q. You’ve sold me! Where do I get a book of my very own? A. Hunt me down and buy one from me personally, because I always carry them with me. But if I don’t happen to personally be around, you can find them at Barnes & Noble, Sundance, Larkellen, Reno eNVy, Grassroots and, of course, Amazon. If you love the book as much as we do, please leave your review here. Thank you!